Aborigines and the Torres Strait Islanders of Australia have been the original indigenous inhabitants of the continent. It has been evident from different researches that the indigenous people of Australia have been in more disadvantageous positions, than its immigrant counter parts. After immigration of the European settlers in the continent the conditions of these people deteriorated. They were subjected to racial apathy and neglect. The European and the western settlers with modern and advanced education progressed and exploited the natural resources of the country. This led the people to a further dis-advantageneous position in the country. In the recent decades, in order to preserve the culture and provide them with basic amenities, government of Australia has formulated policies and measures to provide them safe guards. In this essay the following factors of education, Employment and income, Health behavior and life style, and in terms of Racism and racial-discrimination. In the recent decades it can be stated here that the focus has shifted. Previously these people were exploited and neglected but now they are protected. The country has formulated policies to promote indigenous education of these people so that their traditional education and the intricate knowledge of medicinal herbs, culture, and literature can be preserved. This would help the tribal people in maintain and preserving their culture. 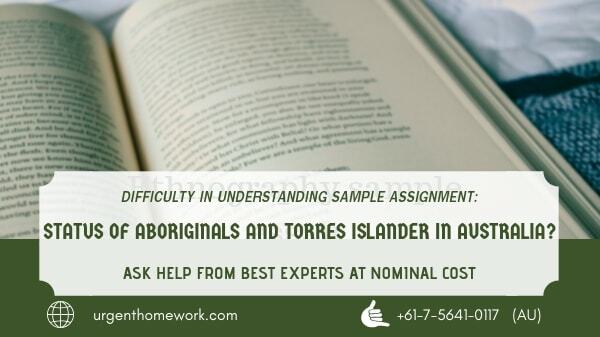 It has been evident that the aborigines and Torres Strait islanders lead a type of nomadic life and very less often are willing to receive and participate in western educational systems. In the past decade to improve this condition the government has formulated policies to impart western educations to these people so that they can be included in the work force of the country. In order to promote the western education among the aborigines and the Torres Strait islander it has formulated provided guidelines for schools to encourage participation of these people in the process. In this process it has been evident that including these people in the decision making process is absolutely necessary. This would enable to formulate an effective policy which would encourage them to participate in the educational process as these people will be able to understand the problems and obstacles faced by the aborigines in a better manner and provide efficient solutions. This would increase the effectiveness of the projects and help in bettering their educational condition, which in due-course will be able to increase their employability. In the past decade, the government has also made it compulsory that the Aborigines and the Torres Strait islanders have to be provided equality of accesses for educational services. This would enhance the situation in the field of education for them. In this regard the government has also felt that it is important to make provision for the people in terms of literacy and numeracy. In this regard it has been perceived that it is important to provide them with equitable educational out comes (Dudgeon, 2010). It is also important that people with traditional education are provided with opportunities of employment. This would help them with economic opportunities and would also help in improving their health standards. In the present context it can be said that there have been improvement in the conditions due to the measure that has been take in the last decade but it becomes apparent here that lot needs to be done to make them a part of the population. The areas where the aboriginals live are remote and distant from localities. This makes it further difficult for them to access educational facilities; the government has taken special endeavors to provide them similar facilities in their places of dwelling. If this can be implemented in an appropriate way it will result in up liftment of the standard that they live in (Zubrick, 2010). In regards to employment and income it can be stated that main problem lies because of the employability concern. If western education can be provided to these people they can be readily employed which will help in improving the income standard. In this context it can be stated that with financial solvency the health concerns will be reduced. This is because they will be able to access better medical facilities and follow proper nutritional regimes. Commercialization of the handicrafts of the aboriginal and Torres Strait individuals will provides them with employment and income opportunities (Sullivan,2012) This would also help them in reaching solvency which is an essential factor in reducing the problems of health. In this regard it can be stated that the geographical areas where the aboriginal dwell are exotic and gives a view if their cultural heritage. Formulating appropriate tourism programs in these areas will help in creating appropriate business opportunities for them. In this regard it can be further stated that the Australian government has tried to develop various recreational opportunities in and around the settlement. Various researches have portrayed that these activities have not only provided them with financial solvency but has also with infrastructural facilities. This has also enhanced the chances of income generation for these people. The commercialization of the artifacts made by the aboriginal have a good international market and therefore it is in the interest of the country to commercialese them. This would help the country in earning important foreign exchanges and important financial opportunities for the country (Dean,2010). In addition it can be stated that in order to address the employment and income issues of the aboriginal people, the government of Australia apart from providing them with forestry rights provides them with vocational training which makes them employable. In this case it can be further stated that employment and financial solvency provides people confidence. This will also result the aboriginals to move towards the cities towns and villages in Australia. This will also help them to lead a better quality of life. This becomes essential in the present context that the aboriginals are living in. This will also help in protecting the environment; with better economic solvency the aboriginal will exploit less of natural resources and will help in protecting the environment in a better manner. It has been evident from different case studies that aboriginal people has health and life style issues. It has been evident from government and other reports that the average life expectancy of the aboriginals and Torres Strait people is about 10.6 years. These facts point out the dismal quality of life that the aboriginal people must have been experiencing. It also portrays that these people dies in their initial years. It can be derived from here that the people of this tribe die in their initial years. This is because of insufficient nutrition, lack of access to health care and medicinal facilities and lack of access to pure drinking water cause this high mortality rate among these people (Wakerman,et al. 2008). From here it can be further stated that these people must be having a very high child mortality rate. In this regard it can be further stated that the life style led by these people also add to this phenomenon. The people due to lack of education do not have knowledge of proper family planning and this is the reason behind high mortality rates. In this regard it can be further stated that the government should enhance on programs for creating awareness, which will decrease the chances of mortality. In this regard it can be further stated that the health regimes followed by these people are also poor which leads to high mortality rates for them. These includes improper sanitary habits which results in health concerns for these people. They also indulge in consumption of alcohol and tobacco. In addition it can also be stated that the tribal are involve in inter tribal conflicts t and rivalry among themselves. This also reduces the quality of life for these people. In addition it can be further stated that the aboriginal men are involved ill treating their female counter parts. This also reduces the quality of life experienced by these people. In this regard it can be stated that the government needs to look into the matter and formulate appropriate policies which will help in improving the conditions of these people. In this regard it can be further stated that the improvement in income and employability will help in bettering the quality of life for these people (Shilton and Brown, 2004). In this regard it becomes further evident that education plays vital role in increasing the quality of life, as it provides knowledge to people for adopting correct measures. It also helps in attaining the minimum income required for the sustenance of life and required nutritional requirement. In this regard it can be further stated that the implementation of the government programs and initiative have been able to increase the life expectancy by 1.6 years, which can be considered as positive development. It can be stated here that racism and racial discrimination have been a very dominant factor in the Australian scenario. It has been cited in various cases that the aboriginals and the Torres Strait people have been victims of racism and racial discrimination indifferent forms by the immigrant population of Australia. This discrimination has been in terms of colour, race and ethnicity. The immigrating classes have been discriminating the aboriginals in this regard, it can be further stated that they have been barred from entering government job and they have stopped interacting and assimilating with the people with different skin colour. The government after many programs and initiative has been able to stop this in some regard. The government in order to irradiate the problem has formulated special laws and accts to protect them. In this case it can be further stated that the acts of racism and racial discrimination is considered as a offence, by the international human rights commission. The government of Australia has adopted this approach. In order to safe guard the aboriginals the government has made strict order that the people who discriminate against the aboriginals would be dealt with stricture according to law. In this section it can be stated that the prevalence of racism and racial discrimination is often recorded in Australia. These phenomenons have been true even after the implications of the government rules and laws. It can be further stated that creating awareness programs among the people have been more effective than that of formulating laws and regulations. It has been often noted that the tribal people have often been isolated from the day to day activities of a common Australian (Sullivan, 2009). It is true that at one point of time these people have been discriminated organizationally as well, where scope on employment or enjoying any such civic activity was denied to them. This affected the people economically and in turn medically as well. The reason is that when they were denied jobs, they were not able to sustain themselves and became nutritionally weak. This created health problems for them. Therefore the impact was severe on the community leading them to further isolation. They were also discriminated form availing medical facilities as well. The lack of income further created the problem of accessing the medical facilities which deteriorated their health standard and quality of lives. The geographical factor also led to their isolation and discrimination and at the same time these people have moved far away from the cities and civilization. This has been the result of racism and racial discrimination. The government is trying its best to eradicate it (Yotti’Kingsley et al. 2010). It has been evident from the research conducted that the aboriginal tribes of Australia have been discriminated heavily by the immigrant population in the past. This has resulted in their isolation and alienation. Presently the situation is changing and they are becoming a part of the main stream population. In making them a part it is important to provide them with appropriate educational facilities and opportunities that the other people have. It has been also been evident that they should be protected from any sort of vulnerabilities apparent in the societies. Income, employment and education will help in uplifting the standards and also eliminate the factor of discrimination. ‘Yotti’Kingsley, J., Phillips, R., Townsend, M. and Henderson-Wilson, C., 2010. Using a qualitative approach to research to build trust between a non-Aboriginal researcher and Aboriginal participants (Australia). Qualitative Research Journal, 10(1), pp.2-12. Dean, C., 2010. A yarning place in narrative histories. History of Education Review, 39(2), pp.6-13. Dudgeon, P., Wright, M., Paradies, Y., Garvey, D. and Walker, I., 2010. The social, cultural and historical context of Aboriginal and Torres Strait Islander Australians. Working together: Aboriginal and Torres Strait Islander mental health and wellbeing principles and practice, pp.25-42. Shilton, T.R. and Brown, W.J., 2004. Physical activity among Aboriginal and Torres Strait Islander people and communities. Journal of Science and Medicine in Sport, 7(1), pp.39-42. Sullivan, P., 2009. Reciprocal Accountability: Assessing the accountability environment in Australian Aboriginal affairs policy. International Journal of Public Sector Management, 22(1), pp.57-72. Sullivan, P., 2012. The personality of public documents: a case study in normalising Aboriginal risk. Journal of Organizational Ethnography, 1(1), pp.52-61. Wakerman, J., Humphreys, J.S., Wells, R., Kuipers, P., Entwistle, P. and Jones, J., 2008. Primary health care delivery models in rural and remote Australia–a systematic review. BMC Health Services Research, 8(1), p.276. Zubrick, S.R., Dudgeon, P., Gee, G., Glaskin, B., Kelly, K., Paradies, Y., Scrine, C. and Walker, R., 2010. Social determinants of Aboriginal and Torres Strait Islander social and emotional wellbeing. Working together: Aboriginal and Torres Strait Islander mental health and wellbeing principles and practice, pp.75-90.